Niwa approaches policemen guarding around the Diet Building with a request to hold them in his arms like a baby. Through the act of a citizen attempting to hold a police officer who is usually expected to protect the citizen, we are brought to consider the relations between the individual and state system about who the police are protecting from what in the first place. In reality, all negotiations end in a failure, but by reading between the lines of their exchange of dialogue, one can draw out certain questions regarding what we fear as well as what we predict and assume. Furthermore, with an interest in the consistency between the actual conversation and the subtitles added to a video afterwards, Niwa intentionally adds subtitles that are clearly incongruous with the original speech and thus breaks down the scenario of dialogue in real life. 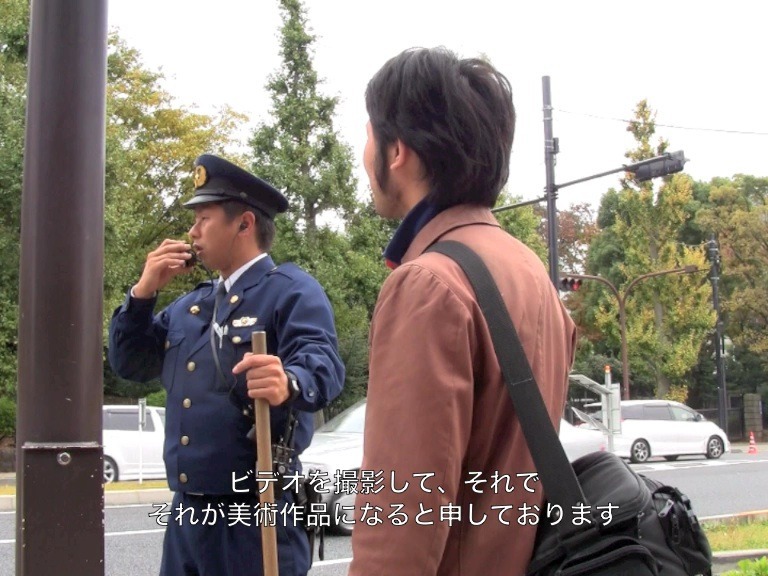 By deliberately adding fiction to the documentary in order to confuse the line between fact and fabrication, Niwa raises doubts about how the response of the policeman might be aligning with what the viewers wish to hear.